Decolor B Cream Plus 7.5 Fl. Oz. Innovative cream formula for on-or-off-scalp use, lightens up to 9 levels. Protective oils leave hair with ultimate condition and shine. 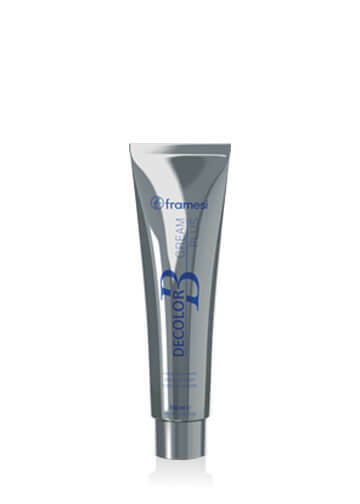 Framesi Decolor B Cream contains a special formula with protective oil to lubricate and protect the hair, while minimizing scalp irritation. Perfect for the most “drastic” lightening services and for effectively bleaching re-growth. Pour necessary quantity of product in a plastic bowl and determine its exact weight. Add the developer cream (PROXIMA or OSSIDORR) following the directions for the volumes, amount, and levels of lightening desired. Mix well with a flat brush until a dense, homogeneous cream is obtained. Apply to the hair and leave on for 20 to 60 minutes, according to the type of hair and degree of lightening desired. Rinse well after application. Wash hair with SHAMPOO GO of the FRAMESI COLOR METHOD line and finally condition withCOLOR METHOD MASK. Paraffinum Liquidum (Mineral Oil/ Huile Minerale), Potassium Persulfate, Ammonium Persulfate, Sodium Metasilicate, Sodium Stearate, Magnesium Carbonate, Sodium Silicate, Magnesium Stearate, Silica, Carbomer C.I. 77891 (Titanium Dioxide), Sodium lauryl sulfate, Tetrasodium EDTA.